DAMIAN MOGAVERO got his MBA from Harvard Business School with the intention of bringing all that he learned to the hospitality industry. In 1999, he developed the Avero software that now runs over 8,000 high-end restaurants, hotels, casinos, nightclubs, and small and large independent local eateries in 68 countries, transforming how restaurant managers and owners made decisions about serving their customers and running their businesses. "Avero has become the go-to tech company for the hospitality industry, but the secret to Damian's success lies in his deeply rooted passion for food.... which The Underground Culinary Tour illustrates brilliantly!" "Damian shows how analytics and thoughtful food make for a memorable meal for both patrons and restaurateurs alike. His work was the source of great value to Caesars and will be to you, no matter the industry, whether you run restaurants or simply dine happily in them." "Damian's incredible vision and ability to combine his passion for food and analytical intelligence have helped bring an extraordinary tool into existence. The insights and information Avero offers have allowed Lettuce Entertain You and the entire hospitality industry to see a different side of the business." --Kevin Brown, CEO and President of Lettuce Entertain You Enterprises, Inc.
"Our economy is being reshaped, industry by industry, by entrepreneurs who connect content with technology to develop applications and platforms to advance efficiency, productivity and profit. In the restaurant industry the pioneer leading the charge is Damian Mogavero. 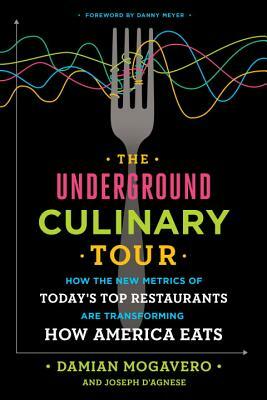 And where does Damian learn the trends – as we discover in this remarkable book, from the Underground Culinary Tour!" "Damian and Avero have positioned themselves at the convergence of the art and the science that creates a great restaurant experience. . .Through The Underground Culinary Tour, Damian allows you to join him on the exhilarating (and exhausting) tours that he has hosted to highlight great work going on across our industry. Enjoy the ride!" --David A. Pace, CEO, Jamba Inc.